On Friday the boys got to go to school dressed as something with P and take a pound for Children in Need. 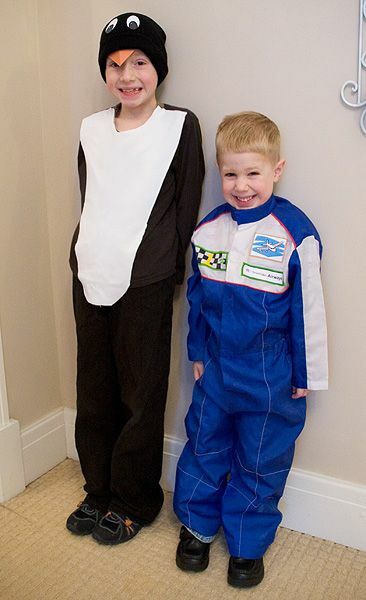 Daniel went as a penguin and Noah was a pilot. For Daniel's costume I simply cut a piece of white fabric and safety-pinned it to his black top. Some orange cardstock stapled to his black beanie and a couple of white cardstock eyes completed the costume. Noah he wore his race-card driver outfit. I created two stickers to stick over the car graphics - one of a plane and one saying "[school name] Airways".